Life is too short to have a boring mailbox. I'm not saying to glue plastic flamingos all over it with flashing lights (although that would be really cool! ), but a little decoration wouldn't hurt! The key to this project is to use Aleene's® Spray Acrylic Sealer™ to seal everything in! 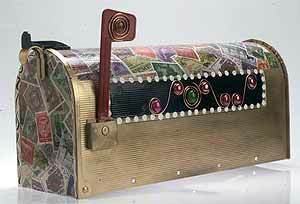 If you don't want to use it as a traditional mailbox, you can set it in your garden or art room to use for storage. Spray paint the box if desired. Let dry. Apply Collage Pauge and affix images. Apply more Collage Pauge on top of images. Make sure all the edges of the paper are sealed down. Let dry. Usepaint to add polka dots around the images, let dry. Spray with sealer, let dry. Repeat two times to create a thick protective coat. Apply crystals as desired using the heat set tool.